The key aims of the DISH conference are inspiration, knowledge, skills, innovation and networking. The primary target group are the heritage professionals who take decisions on the nature of and investments in digital activities. Besides heritage professionals, Dish is also meant for policy-makers at governments and funds, and representatives from adjacent domains, such as education, science and the creative industries. Noterik was very pleased to be able to co host the workshop along with Sound and Vision and talk about one of the domains we are involved in namely the creative re-use of cultural content in light of our participation in the E-space project together with RICHES, Civic Epistemologies and Photoconsortium. One of the strategy spearheads of the E-space program is the development of innovative applications. Noterik plays a very important role in this development as can be demonstrated by the development of our multi screen toolkit allowing for rapid development of multi screen applications. We were able to show various prototypes of applications developed with the use of the multi screen toolkit at the first E-Space hackathon which took place in Amsterdam earlier this year. One of the star applications that was highlighted is the “museum spotlight app”. 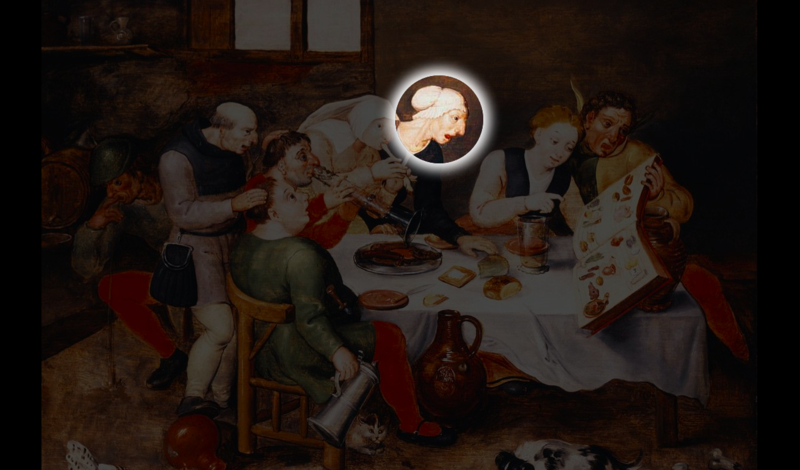 The museum spotlight allows visitors to use their mobile devices to logon to the application and control a spotlight pointer on their phones to highlight persons and objects on a digitally displayed painting or picture (see demo movie). Once the desired person is highlighted you can add text using your microphone. The audio can be played back by another person when he highlights the object. This can have both an educational purpose or can be used for fun by groups of people. Also as a direct result from the development of the multi screen toolkit our new and innovative audience engagement platform Qandr was discussed. Qandr allows you to get valuable feedback from your audience whether you are hosting an event, giving a presentation or attending a business meeting. If you want to know the views of your audience when for instance you are showing a slide, a graph, a picture or holding a strategic meeting, you can easily use Qandr to collect that information. Qandr makes use of all the mobile devices present in the audience. Qandr will play an important role in the upcoming photo pilot and museum pilot where the platform will be used by participants in their efforts to re use cultural heritage and engage the audience. Noterik is very pleased to participate in these upcoming events and we will keep you posted on the progress we will make in developing innovative applications.